We are all for treading upon unfamiliar ground, but sometimes it’s best to let someone else do the traveling—like when the destination is an active volcano. The Blaze’s Liz Klimas explains where this volcano is situated; “A helicopter brought them to the site of the volcano, which is located in Ambrym Island in the Pacific Ocean of Australia’s coast. From there, the crew rappels down a steep incline, inducing vertigo with one of the more harrowing images from the video at about 55 seconds in. 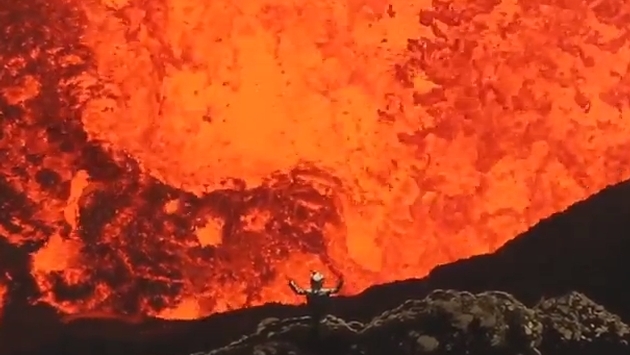 Not that the entire video isn’t completely filled with jaw-dropping images, because the end of the descent brings the adventurers to chaotic and bubbling magma. Active volcanoes seem to be working overtime at the moment, simply for all the press they are getting. CNN, for example, recently reported an Icelandair pilot took the scenic route around Bardabunga to give passengers a view. Little did we know that around the world, another group of travelers were getting far closer to an actual volcano. The human spirit is amazing and, in this case, downright mad.